ReRun Truck Parts - Used truck parts that are NEW to YOU! Sign up to stay up-to-date with the latest offers, and newest products! Our body shop has a 60 foot long, state-of-the-art, semi-down draft paint booth capable of holding two tractors or a complete tractor trailer. When placing an order for a replacement hood or door assembly you have the option to have it painted by our professional technicians, so it's ready to be installed on your truck when you receive it. 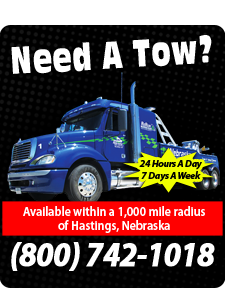 We offer 24/7 Towing Service to meet your towing needs within a 1,000 mile radius of Hastings, Nebraska. 2017 ReRun Truck Parts wholly owned by Nebraska Truck Center, Inc- All rights reserved.